2 Today, anywhere in China. Everyday, millions of square meters of old slums are torn down to make room for luxury condos and shopping malls. 2.1 Demolition of an urban village in China. Today, anywhere in China. Everyday, millions of square meters of old slums are torn down to make room for luxury condos and shopping malls. Although these neighborhoods are demolished, people try to lead a normal life. 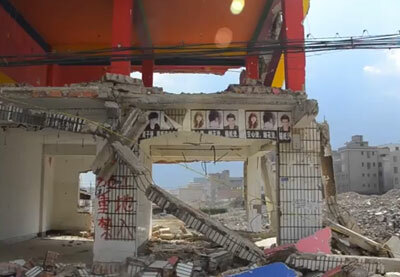 Demolition of an urban village in China.